At 11 am, observe a moment of silence for those who’ve fought and died while in service. 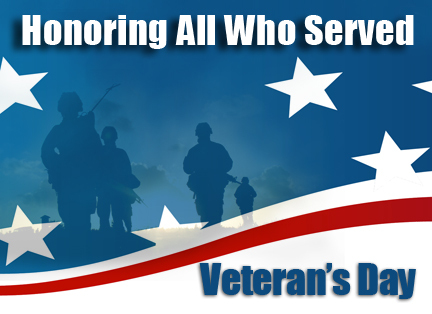 Attend a Veterans Day Parade! Thank a vet for his/her service to our country. Send a letter to troops through the US Dept. of Defense Website. Volunteer in a homeless shelter or soup kitchen. Visit a veteran’s grave or pick up trash in a veterans cemetery. Visit the family of a veteran who is serving overseas. Visit with a wounded vet at a local VA facility. Donate to the USO, the American Legion, Veterans of Foreign Wars USA or other organizations that honor and assist vets. This entry was posted on Wednesday, October 30th, 2013 at 6:22 pm	and is filed under Articles, Events, News & Updates. You can follow any responses to this entry through the RSS 2.0 feed. Both comments and pings are currently closed.